Melt the butter in a non-stick pan then add the onion, carrots and mushrooms and cook for 3-4 minutes. Increase the heat and add the mince and fry for a further 3-4 mins until the lamb has browned. Stir in the stock, Worcestershire sauce, wine, tomato purée and some seasoning. Gently bubble for 15-20 minutes until the mince is completely browned and the sauce has thickened. Pour into the base of a pie dish and set aside. In the meantime, peel the vegetables and cut into chunks. Place the turnip, carrots and parsnips into a saucepan of boiling salted water and boil for 6 minutes then add the potatoes and sweet potatoes. Cook for a further 20 minutes until the vegetables have softened, then drain. Mash the butter into the vegetables and season with a little salt and pepper. 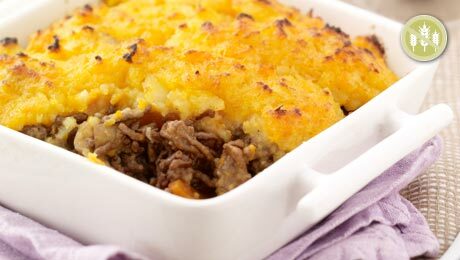 Spoon the mash onto the mince and place in a preheated oven for approx 30 minutes, until bubbling and golden brown. Serve with some green beans.